Our 20cm saucier posses the unique curved profile which facilitates stirring with no awkward sharp angles. Careful regulation of temperature is crucial when creating delicate sauces and reductions, which is why solid copper is the choice of so many experienced chefs. Falk Culinair combines the superior thermal conductivity of copper with non–reactive stainless which makes sure your recipes taste as they should. Falk Culinair. Bright ideas begin here. Falk Culinair brings you excellence to last a lifetime! I really do like this item as I used it for a week. It looks very beautiful but quality. Also I am very appreciated of the company’s after sales service when I phoned to change some items I bought. It is very experienced and very important for a customer to keep it in good memory. This is the third article I have purchased. I live in France and I am amazed by the speed of the delivery. Two days after placing order. 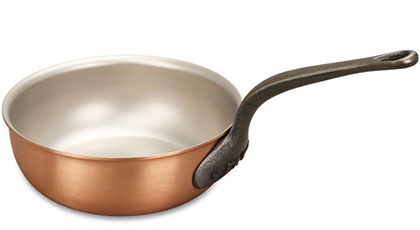 The pans are beautiful to look at and so agreeable to use. Easy to clean. My son is very pleased with the saucier I gave him for his birthday. In a world where mediocraty seems to be the order of the day,how good it is to find something so superior. 286 customers found this review helpful. Did you? Yes, I did!